RESIDENTS living near the River Ribble in Preston and Penwortham are to find out more about the new Floodwatch scheme which is to operate in their area. On Thursday 29 November - TONIGHT - at the Central Area Forum at 7pm, Environment Agency officials will give more details about Floodwatch to Broadgate residents, ready for when the scheme comes into effect in and around the Broadgate area of Preston. On Tuesday 4th December - next week - at Kingsfold Community Centre at 7pm residents of Middleforth and Lower Penwortham can find out the same information for their area. Although the River Ribble has not experienced recent flooding problems, the Environment Agency is introducing Floodwatch in the Broadgate area of Preston and the Penwortham area of South Ribble, following the lessons learned from the severe flooding that hit other areas of the UK during the summer. The scheme will be available in the New Year for properties in the Broadgate area. If there is a flood forecast, properties that have registered for the service will be able to receive a warning directly from the Environment Agency by telephone, text message, email, fax or pager. As well as providing information about the service and how to register, representatives from the Environment Agency will also be asking local people to come forward with ideas to help develop a local flood plan for the area. You can find out how to register for the scheme for your area on the Environment Agency Flood Warning website. about Floodwatch and what it means for them. 1. The Central Area Forum meeting is taking place at 7pm on Thursday 29 November at the Gujarat Hindu Society Centre, South Meadow Lane, Preston. For a copy of the agenda, visit: the PCC website here. The Penwortham South meeting is at 7pm on Tuesday 4th December at Kingsfold Community Centre. 2. Floodwatch is a scheme operated by the Environment Agency, a Government body that is responsible for managing river environments and assisting in the prevention of flooding. Officials from the Environment Agency will be attending the Central Area Forum to explain more about Floodwatch, which will be operating in and around the Broadgate area of Preston. 3. The Environment Agency aims to give at least two hours notice of an incoming flood. The receipt of a flood warning will give people time to take action to protect their family and their property. It's important that those at risk register for this service. People can find out if they are at risk by calling Floodline 0845 988 1188 or by logging on to the Environment Agency website. 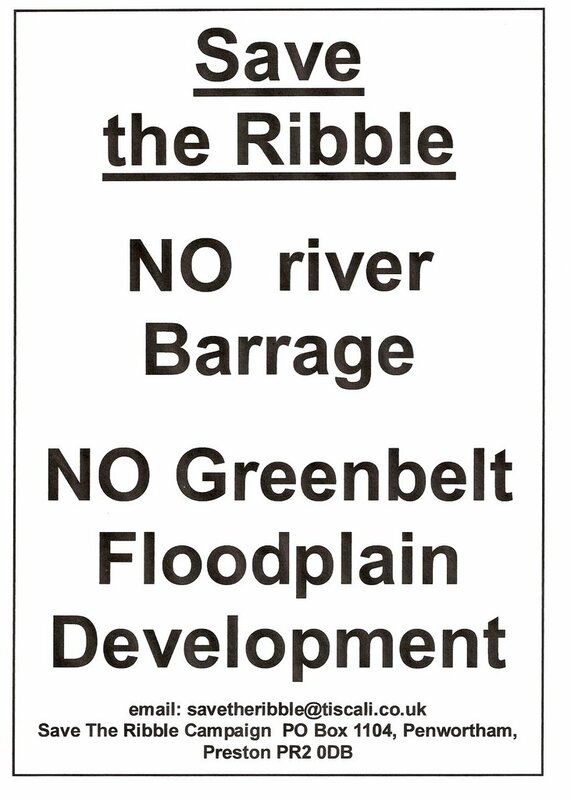 HAS THE RIBBLE BEEN SAVED? It seems that the barrage scheme is about to be thrown off the agenda and into the dustbin - although it is clear that we need to ensure this does happen - and that it can't be resurrected 6 months or 6 years or 6 decades from now. "As long as this Conservative administration is in control it will not happen. "The whole of the riverside is totally dependent on South Ribble's vision of the future. "As far as this administration is concerned, the barrage scheme will not be looked at." ‘Still water would enable attractive promenades to be built alongside parts of the river and pursuits such as rowing re-established’ and that the barrage 'would also allow a mirror park on the opposite bank to Avenham & Miller Park to be laid out, creating a magnificent central park for the area with bridges linking the two elements’. …efforts are being made to clarify Preston City Council’s position ON ALL FRONTS, and ascertain once and for all whether the barrage and associated riverside developments are being consigned to the dustbin for good. At the first Public Meeting about the Riverworks scheme - co-organised by Riversway Councillors and Save The Ribble Campaign - a number of experts gave their views on the Ribble barrage and Green Belt/Floodplain development proposals, and the packed meeting was able to listen to the issues first hand and ASK QUESTIONS. Meeting Rooms A and B at Preston Town Hall were filled to capacity as over 80 local residents attended the public meeting about the Riverworks Scheme and took the opportunity to express their views about the proposals to build a barrage across the River Ribble and houses and businesses on our Green Belt. Public interest in the meeting was so great that a number of residents were turned away at the door because the meeting room was full. 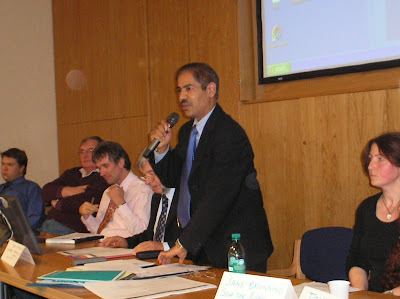 The meeting was chaired by Councillor Bhikhu Patel, and members of the public had the opportunity to question City Councillors and listen to presentations from Leader of Preston City Council Cllr Ken Hudson, Cllr John Swindells, ex-cabinet member for the Environment, Save the Ribble Campaign, the RSPB, the Lancashire Wildlife Trust and the Ribble Fisheries Consultative Association. In summary, the first half of the meeting involved a number of presentations from the panel of experts, explaining the key issues for and against the Riverworks scheme – although particular emphasis was placed, as expected, on the Ribble barrage and the Green Belt development proposals. The presentations covered a number of aspects from the specific Riverworks proposals themselves through the environmental impacts on wildlife, biodiversity, protected species and habitats, flooding and siltation issues, and economic costs, to the specific nature of the River Ribble, how it functions, and exactly how the barrage would interfere with these functions. Many of the presentations were reinforced by scientific, professional, and legal evidence, and provided a comprehensive examination of the issues. Overwhelming demands that the barrage and building development schemes be officially and publicly consigned to the dustbin for good. Cllr Patel opened the meeting by saying it was an opportunity to hear different views about Riverworks and for residents to have their say, before inviting Councillor John Swindells to begin the presentations. Councillor Swindells presented his position that Ribble Barrage would be a costly scheme that will damage the River forever. Councillor Swindells was the City Council Cabinet member for the Environment when the Riverworks proposal was first developed. He accepted that there were some positive aspects of the Riverworks project such as the ideas to improve the dock area. However, from the outset of Riverworks he has always been sceptical about the idea of a barrage. His scepticism was confirmed when he visited the Cardiff Bay Barrage and found that it has caused siltation problems, plagues of mosquitoes and the loss of important bird species. He also pointed out that managing the environmental problems caused by the barrage continues to cost £20 million a year whilst the barrage itself cost £360 million more to build than the original estimate of £40 million. Councillor Swindells became convinced a barrage on the Ribble was a bad idea and should never be built when he spoke to Cardiff organisations and local environmentalists who highlighted the environmental damage and increased flood risk that has occurred as a result of the Cardiff Barrage. The Leader of Preston City Council, Cllr Hudson, was then given opportunity to explain the current position of the Riverworks proposals. Cllr Hudson said that the Riverworks debate had become dominated by the issue of the barrage. However, while he believed that the River did look better with water at a permanently high level, he admitted that there was a lot of opposition to the barrage. He claimed that the Council had listened to members of the public and campaigners (presumably including Save the Ribble) and as a result had decided to split the Riverworks proposals into three different schemes: Riverside (the Barrage and associated riverside building developments); Quayside (the Docks), and Canalside (the Lancaster canal scheme). He said the Council would now be concentrating priorities on schemes to improve the dock and canalside. He claimed that the Barrage scheme was now “out of the window”, and that future developments around the barrage and green belt development depended on the priorities of South Ribble Borough Council. 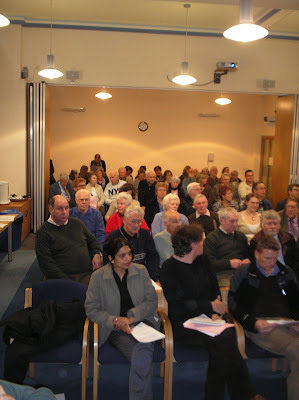 At this point a number of members of the audience demanded clarification of the Council’s position. Was the Council now saying the barrage would never be built? Bhikhu then introduced Jane Brunning from Save the Ribble Campaign. Jane thanked Bhikhu for the clarification and said that as the barrage is still on the agenda, the campaign to oppose the barrage and green belt development would continue until the scheme is dropped altogether. 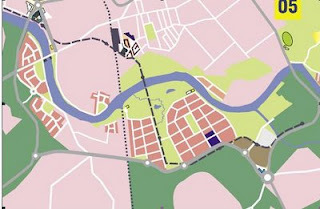 Jane began with the Green Belt and floodplain urban development proposals: the “Central Park” development. She said that the largest area which would be affected by the proposals is the Penwortham to Walton le Dale Green Belt and Floodplain, but that Penwortham Holme and the sports pitches and allotments in that area, Frenchwood Rec, and Fishwick Bottoms, would also be affected. Jane pointed out that, contrary to claims made in the Riverworks documents that building on these areas would “create a new sustainable community” and “create an open space and leisure resource for local communities in South Ribble and Preston”, all of these areas already ARE quality open spaces, including biodiverse wildlife habitats, wetlands, meadows and woodlands, football pitches and allotments, therefore building on any of these areas DEPLETES rather than “creates” quality open spaces. She also pointed out that loss of quality open spaces and building on the floodplain which currently protects a large number of communities from greater flooding risks actually makes existing communities LESS sustainable. Jane then moved on to the barrage proposal. She emphasised that, contrary to the Riverworks claim that the benefits of a barrage would be to create leisure and tourism opportunities, cover unsightly mudflats, and enhance flood defences, the benefits of protecting the Ribble’s free-flowing intertidal habitat includes not only the wildlife, but is a great benefit to our flood defences, and creates unique opportunities for sustainable tourism. Jane explained the delicate and dynamic balance of an intertidal habitat, and why it depends upon the uninterrupted flow of fresh water, silts, and nutrients from upriver mixing with the salt waters and silts on the estuary. She also explained that interfering with this free-flowing intertidal ecosystem not only damages a range of wildlife and habitats, both upriver and downriver, but could also increase floodrisk. Jane pointed out that the Ribble is the most important river estuary in the UK for wildlife, and that it is protected under UK and International law, as well as being the UK’s pilot river basin for the implementation of the European Water Framework Directive – aiming for sustainable water management – and she pointed out that the Environment Agency have raised concerns that “a barrage across a main water body places it at high risk of not achieving the WFD objectives”. Jane said that the Ribble has ongoing management strategies which aim to protect its wildlife and also its flood defences. She pointed out that none of these official strategies have identified the need for a barrage to protect our communities from flooding but they HAVE identified the need to create more Ribble wetlands as effective and sustainable flood defences. Jane said that the Conservation Regs 1994 legislate against any development taking place which “might” impact on the Ribble’s Special Protection Area unless there is “no alternative” – and she pointed out that there IS an alternative: don’t build one. She explained that by not barraging the Ribble, and by not building on the Green Belt and floodplain, we will not only be protecting unique wildlife and habitats and our flood defences, but will be protecting the most important asset of the UK’s newest Regional Park – Ribble Coast & Wetlands – and that we can also contribute new tourist destinations to the Regional Park by designating the River Ribble and Green Belt areas which run through South Ribble and Preston a new countryside park. Tony Baker, RSPB Ribble Site Manager, spoke next. Tony Baker said that the River Ribble is the single most important river in Britain and should be cherished, and placed it in the top 3 attractions in the North West. He said that building a barrage on the Ribble would be the equivalent of landscaping Scafell Pike to make it easier to climb. He said the Ribble is of international importance, supporting a quarter of a million birds on the estuary every day in winter and forms a vital link for many millions of migratory birds from all over the world. These birds rely on the Ribble mud for survival and this mud would be lost if the Ribble was barraged – directly putting the survival of these birds at risk. Tony also explained the importance of salt marsh for flood protection. Tony said that Preston City Council was right to make the most of its natural resources but that this should not be at the expense of damaging the Ribble - the “jewel in our wildlife crown”. Dave Dunlop, Conservation Officer for the Lancashire Wildlife Trust, explained that the Ribble is important not just for birdlife but also other wildlife, including marine species. The Ribble is an important breeding ground for fish such as sea bass, crab species and harbour porpoises. The silt from the River is contributing to the development of the important sand dunes in Sefton and St Annes which are significant and protected areas for a number of species. He explained that the Ribble estuary is already much smaller than 150 years ago due to land reclamation and channelling the river for the docks. He emphasised that a barrage would put further strain on the estuary and would cause increased flood risk. 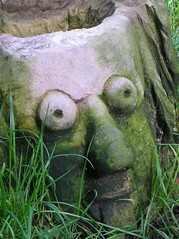 Dave urged Preston City Council to lead rather than follow the mistakes of other cities such as Cardiff, Belfast and Salford, and help Preston become a green City. In a robust and rousing demolition of the Barrage scheme, Dr Mike Horner of the Ribble fisheries Consultative Association explained how a barrage would irrevocably damage the River, the fish who depend on it and the whole angling industry which contributes millions to the local economy. Dr. Horner said that the Ribble is unlike other Rivers because it produces more sediment and siltation than many other Rivers in Britain. All barrages have siltation problems but it would be much worse for the Ribble because of the amount of silt which flows down from the Pennines. A barrage on the Ribble would mean that the river would require constant dredging behind the barrage at great financial cost and posing the question of where all the dredged silt would be put. He pointed out that the River is a spate river and that its level depended on rainfall much further upriver in the Pennines. 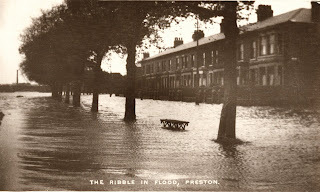 Increased rainfall and higher sea levels as a result of global warming will happen, and this would inevitably result in flooding in Preston if a barrage was built. Because the Ribble is so nutrient rich it is also more likely to support blue green algae which would be a significant risk if a barrage was built – and make water-based activities impossible. He pointed out that the Ribble is one of the top 6 rivers in the country for Atlantic Salmon - which is the 10th most threatened species in Europe. Anglers work closely with the EA to improve the River habitat and Salmon population in the Ribble, which is recovering from serious depletion. Mike also pointed out the importance of the Ribble for coarse fishing. Mike urged residents to enjoy the Ribble because it is an asset to Preston and the surrounding area. He said “We should contribute to it rather than ruin it”. (Editorial note: A number of issues were raised, and we apologise if some speakers are not mentioned individually). One local resident said that, over many years, Preston planners had damaged Preston and said that the Ribble was the last unspoilt area – so it should be left alone. Max, local resident and Save The Ribble campaigner, said that the Ribble barrage and building development proposals would damage the environment, and destroy valuable local amenities including the football pitches his own children and many others from Broadgate and Penwortham and other teams from all over Lancashire play on week in and week out. He passionately urged that the barrage should be taken off Preston City Council’s shopping list rather than just put to the bottom, and he demanded an apology to all local residents for even considering the schemes. The next local resident said it’s about time the council started listening to local people rather than the Vision Board and business interests. One resident questioned the motivation for the plan and what need the barrage was addressing: he just didn’t see the point of it at all. This was followed by a number of comments about commercial interests and property developers. John Weedon, from the Lancashire Fisheries Consultative Association, criticised the Chief Executive of PCC for comparing the River Dee in Chester with the Ribble: he has known both rivers for decades and said it is not comparing like with like as the Dee does not have the same geography or hydrology as the Ribble. Cllr Jim Hothersall of Penwortham said that whilst he was not speaking for SRBC, he stated that there would be no house-building on the area South of the Ribble, and there would be no development at all, including a barrage, if it would have ANY environmental impact. Greg, a Broadgate resident, said the barrage idea had been well and truly demolished tonight. He said that whilst he supported work to improve the Dock area, he warned that waterside developments always increase property prices and squeeze local residents out of their own communities. He also emphasised the importance of the Green Belt in South Ribble for wildlife and biodiversity as he didn’t feel this issue had been raised enough, as well as providing a fantastic amenity for local people from local communities. Local resident Juliet asked Councillor Hudson, in the light of all the evidence that had been heard this evening, will the council will be scrapping the barrage idea? Cllr Hudson replied that it had been a balanced debate tonight, but they still needed the facts that the feasibility study would provide, causing general uproar in the room. He then said that he was convinced that nobody wanted a barrage, “therefore we won’t find the money for a feasibility study”. There was then some debate about the issue of the feasibility study, and whether the barrage is or is not still on the agenda, and Jane Brunning asked why spend hundreds of thousands of pounds on a feasability study when the evidence already exists that the barrage is a bad idea? At this point, Bhikhu Patel asked the SRBC Cllrs present whether they were in support of the feasibility study. Cllr Hothersall replied that South Ribble recognises that there is a siltation problem in the river, and therefore any study would be addressing that issue alone and not the issue of a barrage. A Cllr for the Priory Ward in Penwortham said she would be concerned if the regional plan for the area resulted in an expansion of housing in the Penwortham area, when existing development is already unsustainable. Someone asked why the Vision Board was not present, and Bhikhu pointed out that they had been invited but were busy. Cllr Hudson said that the council is going to have increased input on the Vision Board, and that the Board was important for attracting money for Preston. At this point, Bhikhu asked for a show of hands of all those who are against the idea of a feasibility study. The overwhelming majority of people in the room were opposed to the study going ahead. The overwhelming majority in the room also voted against housing on the South Ribble Green Belt and Floodplain. At this point Jack Davenport questioned Preston Council’s current position on the barrage. 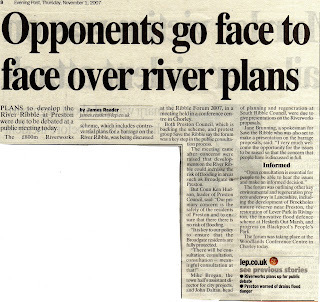 He stated that the recent breaking down of Riverworks into 3 sections was not a recent development as it used to split into 5 anyway, and pointed out that the statement that the barrage was now “on the back-burner” had been made by Cllr Hudson just days after a council officer had given a robust defence of the barrage at the Ribble Forum. He accused Cllr Hudson of spin, and said that “the barrage is still on the cards, make no mistake”. Cllr Davenport criticised the lack of democratic accountability on the Vision Board, and said that the Chair, Malcom McVicar, had said that his job was to ensure that the presence of Councillors on the Board would not be allowed to slow the process down. Cllr Hudson then said “the barrage is dead in the water… at this moment in time, but that it could be resurrected in the future” – to much uproar. There were a number of points made concerning the conflicting positions outlined by Cllr Hudson, Chief Exec Jim Carr in his recent Riverworks position statement, and council officers, which emphasise that Cllr Hudson’s comments do not amount to an unequivocal statement that the barrage has been abandoned. In common with other residents, he expressed concerns that increased floodrisk would result in residents being unable to insure or sell their houses. A local resident from Higher Walton raised concerns about the impacts of being classed as living on the floodplain, and the impacts this will have on insurance. Another resident asked Matt Crump from the Environment Agency his opinion on the issues raised, and Matt Crump said that the Environment Agency had no definite information that would enable them to formulate a clear position as there had been no clear proposals put before them. As a regulatory organisation, they would have to be involved in looking at the impact of a barrage but he could not say whether the EA would oppose the scheme because they had not seen any plan. He did, however, emphasise that everything that had been said tonight about the significant impacts that barrages cause was absolutely correct, and definitely would occur. A spokesperson from Preston Marina said that many years ago, he had been a proponent of a barrage, and had commissioned studies into the scheme, and addressed the issue of siltation as a barrage could incorporate engineering to move the silts. However, he said he no longer supported a barrage, and emphasised that Preston Marina operated perfectly well without one. Unfortunately the meeting had to finish at this point, despite several members of the public wishing to ask questions and raise issues, as the building had to be vacated at 9pm. Bhikhu Patel said that when anything further occurs with the Riverworks schemes, he will ensure another public meeting is held, and he thanked the public and the speakers for their contributions to the meeting. 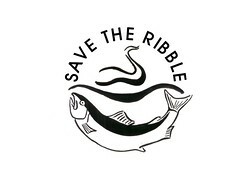 Save The Ribble Campaign would like to thank everyone who came to the meeting, and apologise to those people who were turned away due to the rooms being full to capacity so were unable to get in and contribute to the debate themselves. as well as sincere thanks to Councillor Bhikhu Patel for co-organising and Chairing the meeting, and Cllr Jack Davenport from PCC and Cllr Jim Hothersall of South Ribble for their contributions. 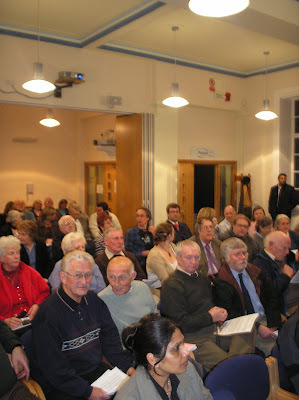 You can read the Action Ribble Estuary blog for their summary of the meeting. A report has been published by the Local Government Association (LGA) today which claims that 'Action is needed "urgently"' to protect communities and infrastructure against flooding across the country. The LGA argue that there urgently needs to be 'more investment in flood defences and drainage' - and that the three years Local Councils will have to wait to see the money pledged by the Government for these measures "is simply too long to wait". "There is no guarantee we will not see a repeat of the heavy rainfall which led to that flooding, and so it is vital we start improving our systems and defences as soon as possible. "The government provided additional funding to deal with the clean-up operation over the summer. The prime minister's decision to invest more in flood defences was also a positive move, but three years is simply too long to wait." - we have also been arguing against increasing our floodrisk by barraging nature's most effective flood defence which safely channels the huge amounts of rainfall (including our land drains) out to sea - our River! 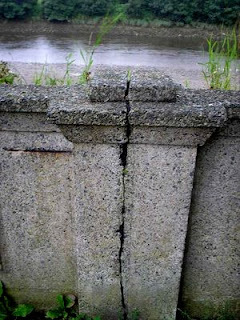 - and we have been urging action be taken to bring the flood defences in our area up to scratch by replacing the post and panel flood defences in Broadgate - which have been termed "inadequate" by the Environment Agency - with more effective structures as soon as possible. With a little thought, the replacement flood defences could also incorporate a raised walkway to allow a better view of the River! For the full story on how our communities are being left vulnerable to flooding, see the BBC News. Don't forget the Public Meeting about Riverworks on Tuesday 20th November, from 7-9pm in Rooms A & B at Preston Town Hall. Barrage Scheme 'Put on Hold'...? ...but until the Ribble Barrage and Green Belt development proposals really are SUNK without trace once and for all, local residents will continue to campaign against these damaging schemes which threaten to damage a unique intertidal ecosystem, and destroy a much-valued green space which provides us with sports facilities like football and cricket, free access to fresh air and nature and wildlife, our fabulous allotments, and vitally important flood protection for our homes. 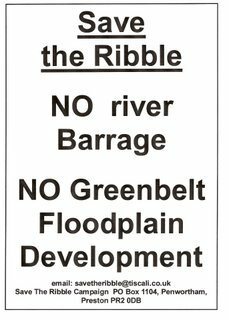 The Public Meeting already organised by Riversway Councillors and Save The Ribble for 20th November WILL STILL GO AHEAD. We sincerely hope that if these schemes are to be considered at all, full public consultation will go ahead AT THE SAME TIME AS FULL CONSIDERATION AND CONSULTATION ABOUT A CLEAR ALTERNATIVE PROPOSAL WHICH LEAVES THE RIVER RIBBLE A TIDAL RIVER AND OUR GREEN BELT AND FLOODPLAINS INTACT. As the LEP Editorial points out, the "Ribble is awash with potential" but we need to ensure we don't "take our eyes off the ball" in our efforts to protect "an estuary which is internationally regarded" and ensure "commercial and political pressure to build new homes" does not mean building homes in inappropriate and unsustainable places - such as on our riverbanks, Green Belt, floodplains, sports pitches and allotments! So we urge our local councils to look at ways in which this can be done without interfering with the natural environmental functions of these unique assets! We have all this already - so we must protect it - for the long term benefit, protection, and sustainability of the environment and all of our local communities! Preston Council should be looking at the long-term sustainability of our environment and our communities - barrage proposals and Green Belt and floodplain developments are NOT sustainable, and nor is trying to downgrade our unique environmental assets - such as great-crested newts - in order to remove them from consideration. We have to consider our impact on our environment NOW, and protect the River Ribble and our Green Belt, wetlands, and floodplains to ensure a sustainable future. As the Preston Dock basin is the largest single dock basin in Europe, couldn't we make much more of such a valuable public amenity than building floating (undoubtedly not even remotely "affordable") homes on it? Surely if Preston Council like the idea of a water sports facility (one of the reasons given to promote the barrage scheme), such a large body of water as the Dock basin is the ideal place - once the blue-green algae has finally been eradicated? A water sports facility - and any other water-based public leisure amenities - here would not damage the river's unique ecosystem, increase flood risk, or cost the £hundreds of millions a barrage would cost. Other ideas in Quayside and Canalside apparently include a mini-tram system to the Docks and water taxis on the Lancaster canal - great! Bring it on - but leave our River Ribble Wild! The LEP story online includes this heartfelt comment sent in by LEP reader "samtwist" - thanks Sam, your support is much appreciated and your sentiments very much shared! "Well done Save the Ribble campaign. I have not been able to take part because of ill health but have been following your campaign. As a resident for 56 years I have been extremely upset by the proposals to develop our beautiful river side. It is a disgrace that any councillors should even consider backing greedy developers who have no conscience. There are plenty of brown field sites in the area without disturbing the precious natural habitat which we do have." At yesterday's annual Ribble Forum - a conference organised by the Mersey Basin and Action Ribble Estuary for interested parties along the Ribble corridor including the RSPB, fisheries bodies, the Environment Agency, Wildlife Trust, and local Councils - the Riverworks Barrage proposal formed a key component. LOCAL RESIDENTS WILL ALSO HAVE THE OPPORTUNITY TO LISTEN TO THE ARGUMENTS AND DEBATE THE ISSUES ON TUESDAY 20TH NOVEMBER IN PRESTON TOWN HALL, ROOMS A & B, FROM 7-9PM. The Forum had a series of presentations followed by a discussion session. - and Jane Brunning of Save The Ribble Campaign who outlined the key issues of concern about the barrage scheme. The Riverworks presentation outlined the key ideas of reinstating the Lancaster canal into Preston, improving the Docks, and ideas to barrage the River Ribble and develop on a number of undeveloped areas along the Ribble corridor. Jane Brunning discussed the damage a barrage would do to the ecosystem of the River Ribble's intertidal habitats, and the subsequent threat to the wildlife supported by this Internationally-important wetland, as well as also raising concerns about increases in floodrisk a barrage could cause. - and by providing effective and sustainable flood defences for all our communities. The Ribble barrage promoted a number of pertinent questions, not least what possible reason there could be for wishing to pursue the idea in the first place, given the overwhelming evidence of the potential damage - not to mention exhorbitant economic costs - of the scheme? f. it rains alot in these parts. Jane also made it clear that Save The Ribble Campaign are supportive of the ideas for the canal and the Docks - and share with Jack Davenport's concerns that these schemes are pursued for the benefit of leisure opportunities rather than an excuse for more housing developments. You can read more about why wetlands are important for wildlife and flood defences and why the Ribble should remain a free-flowing intertidal habitat and why barrages are a bad idea and why building on the riverbanks and floodplains is a bad idea too. ...but in the meantime, come and LISTEN TO THE ARGUMENTS AND DEBATE THE ISSUES ABOUT RIVERWORKS ON TUESDAY 20TH NOVEMBER IN PRESTON TOWN HALL, ROOMS A & B, FROM 7-9PM.